This beautiful Forever Brilliant ring showcases 3.0mm, 2.5mm, 1.9mm, 1.7mm, 1.4mm, and 1.3mm round brilliant cut moissanite gemstone. Beautifully crafted in rhodium plated 14K white gold. Ring size 7. The primary 3.0mm gemstone has a Diamond Equivalent Weight (DEW) of 0.10ct (Actual Weight 0.09ct). The total Diamond Equivalent Weight (DEW) including all thirty gemstones is 0.64cttw DEW (Actual Weight 0.54cttw). This beautiful Forever Brilliant ring showcases 3.0mm, 2.5mm, 1.9mm, 1.7mm, 1.4mm, and 1.3mm round brilliant cut moissanite gemstone. 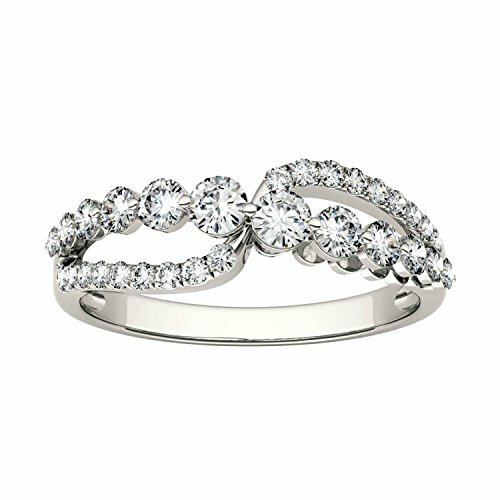 Beautifully crafted in rhodium plated 14K white gold. Ring size 7. The primary 3.0mm gemstone has a Diamond Equivalent Weight (DEW) of 0.10ct (Actual Weight 0.09ct). The total Diamond Equivalent Weight (DEW) including all thirty gemstones is 0.64cttw DEW (Actual Weight 0.54cttw).